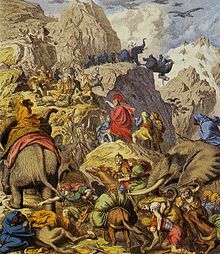 Hannibal (from Punic, literally "Baal is merciful to me", 247 BC – 182 BC) was a politician, statesman and military commander of ancient Carthage, famous for his victories against Roman forces and occupation of much of Italy for 15 years, until a counter-invasion of North Africa forced his return to Carthage, where he was decisively defeated at the Battle of Zama by Scipio Africanus. God has given to man no sharper spur to victory than contempt of death. I have come not to make war on the Italians, but to aid the Italians against Rome. Spoken to Italian soldiers of Rome captured at the Battle of Lake Trasimene (24 June 217 BC) as quoted in Hannibal : One Man Against Rome (1958) by Harold Lamb, p. 119. Ah there is one thing about them more wonderful than their numbers … in all that vast number there is not one man called Gisgo. Variant translation: You forget one thing Gisgo, among all their numerous forces, there is not one man called Gisgo. nullum contemptu m[ortis incitamentum] ad uincendum homini ab dis immortalibus acrius datum est. As quoted by Livy, la:s:Ab Urbe Condita/liber XXI 44, as translated by Aubrey De Sélincourt, in The War with Hannibal (1965). Let us ease the Roman people of their continual care, who think it long to await the death of an old man. Last words according to Livy "ab urbe condita", Book XXXIX, 51. Latin proverb, most commonly attributed to Hannibal in response to his generals who had declared it impossible to cross the Alps with elephants; English translation as quoted in Salesmanship and Business Efficiency (1922) by James Samuel Knox, p. 27. I am not carrying on a war of extermination against the Romans. I am contending for honour and empire. My ancestors yielded to Roman valour. I am endeavouring that others, in their turn, will be obliged to yield to my good fortune, and my valour. As quoted in Hannibal : Enemy of Rome (1992) by Leonard Cottrell, p. 150. Hannibal excelled as a tactician. No battle in history is a finer sample of tactics than Cannae. But he was yet greater in logistics and strategy. No captain ever marched to and fro among so many armies of troops superior to his own numbers and material as fearlessly and skillfully as he. No man ever held his own so long or so ably against such odds. Constantly overmatched by better soldiers, led by generals always respectable, often of great ability, he yet defied all their efforts to drive him from Italy, for half a generation. … As a soldier, in the countenance he presented to the stoutest of foes and in the constancy he exhibited under the bitterest adversity, Hannibal stands alone and unequaled. As a man, no character in history exhibits a purer life or nobler patriotism. Theodore Ayrault Dodge, Hannibal : A History of the Art of War among the Carthaginians and Romans (1893), p. 652. As to the transcendent military genius of Hannibal there cannot be two opinions. The man who for fifteen years could hold his ground in a hostile country against several powerful armies and a succession of able generals must have been a commander and a tactician of supreme capacity. In the use of strategies and ambuscades he certainly surpassed all other generals of antiquity. Wonderful as his achievements were, we must marvel the more when we take into account the grudging support he received from Carthage. As his veterans melted away, he had to organize fresh levies on the spot. We never hear of a mutiny in his army, composed though it was of North Africans, Iberians and Gauls. Again, all we know of him comes for the most part from hostile sources. The Romans feared and hated him so much that they could not do him justice. Livy speaks of his great qualities, but he adds that his vices were equally great, among which he singles out his more than Punic perfidy and an inhuman cruelty. For the first there would seem to be no further justification than that he was consummately skillful in the use of ambuscades. For the latter there is, we believe, no more ground than that at certain crises he acted in the general spirit of ancient warfare. Sometimes he contrasts most favorably with his enemy. No such brutality stains his name as that perpetrated by Claudius Nero on the vanquished Hasdrubal. Polybius merely says that he was accused of cruelty by the Romans and of avarice by the Carthaginians. He had indeed bitter enemies, and his life was one continuous struggle against destiny. For steadfastness of purpose, for organizing capacity and a mastery of military science he has perhaps never had an equal. Encyclopædia Britannica Eleventh Edition (1911). Of a truth the gods do not give the same man everything: you know how to gain a victory, Hannibal, but you do not know how to make use of it. Comment to Hannibal after their victory at the Battle of Cannae. In very truth the gods bestow not on the same man all their gifts; you know how to gain a victory, Hannibal: you know not how to use one. You, Hannibal, know how to gain a victory; you do not know how to use it. This page was last edited on 1 July 2018, at 20:48.